Toting equipment, obstacles, and supplies is a chore. Why not make life easier with these top quality duffle bags. Each bag offered has been hand selected with durability in mind. All bags are extra heavy duty. If you would like help deciding which bag is right for you, please do call or email. We will glady assist you! Solid black, thick and strong pvc lined 900 Denier polyester will carry a lot of weight. All metal hardware gives a sturdy feel. Oversized zipper will last years. It has a versatile adjustable & removable shoulder strap. Strap has a carry handle with velcro closure that will be gentler on your shoulder or hands when carrying. Also has secondary carry handle with padded velcro closure. Quality is number one with this heavy duty duffle bag. Note that this bag will not hold 48" long jump bars, unless the jump bar is cut in two parts and has a coupler. Thick and strong pvc lined 900 Denier blue polyester will carry a lot of weight. All metal hardware gives a sturdy feel. Oversized zipper will last years. 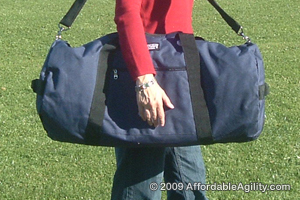 It has a versatile adjustable & removable shoulder strap. Strap has a carry handle with velcro closure that will be gentler on your shoulder or hands when carrying. Also has secondary carry handle with padded velcro closure. Side pocket zippers. Ends have carry handles too. 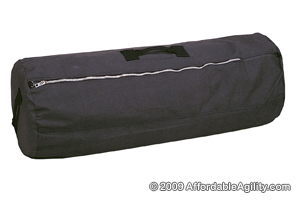 Quality is number one with this heavy duty duffle bag. Note that this bag will not hold 48" long jump bars, unless the jump bar is cut in two parts and has a coupler. 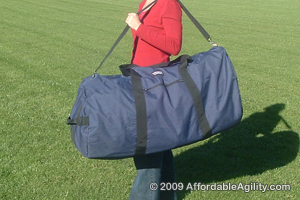 Long duffle-style bag made of a heavy duty, sturdy, 22oz cotton canvas with reinforced stress points, full length zipper, and carrying handles on the top and sides. 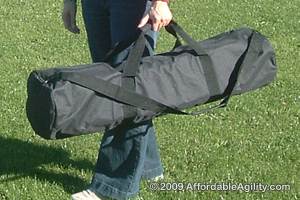 Our recommended bag for toting & storing a manageable amount of obstacles, including standard 48" jump bars. 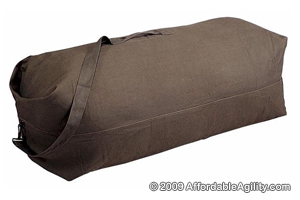 Long duffle-style bag made of extra heavy duty, sturdy, 22oz cotton canvas with reinforced stress points. Heavy weight snap hook closure keeps items secure and in place. Cotton web shoulder strap and handle for easy carrying. This bag, while overkill for simple obstacle carrying, is great for those who have a lot of equipment to tote, including some flatter and bulkier items, as well as 48" long jump bars. 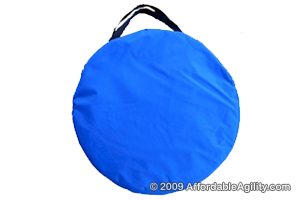 Round canvas bags made especially to hold our different practice tunnels. They have sturdy zippers and carrying straps. The colors are blue, but could change without notice. Note: These bags do not carry Competition Tunnels, as these are too heavy to be put into bags.